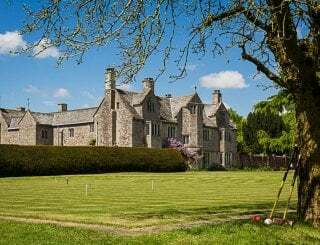 Magdalen Farm, Chard, Somerset, sleeps 10-36 in 8 bedrooms. 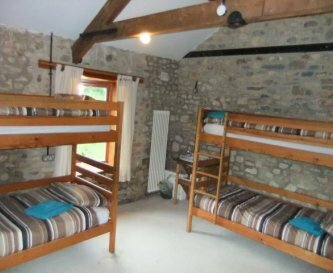 Magdalen Farm, Chard, Somerset, sleeps from 10-36. 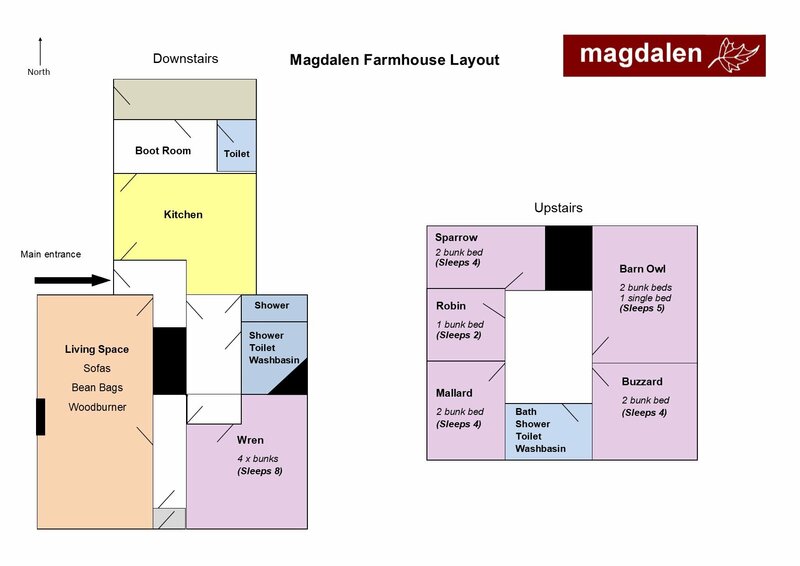 We have two choices of accommodation at Magdalen Farm. 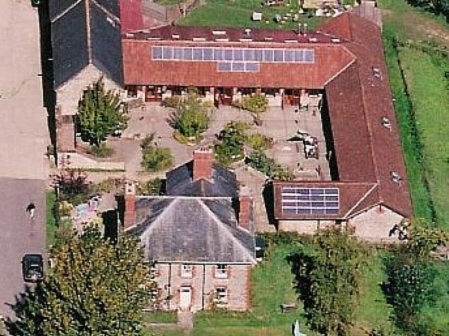 The Courtyard Centre can sleep up to 36 and Magdalen Farmhouse can sleep up to 17. 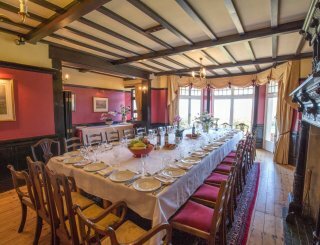 Please note the maximum group size for any self-catered booking is for 36 guests. 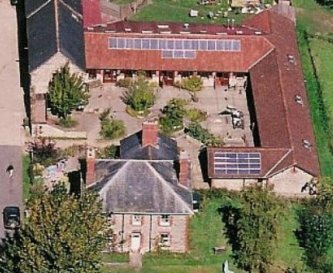 Set in the heart of our working organic farm is the Magdalen Courtyard Centre that can accommodate up to 36 people. 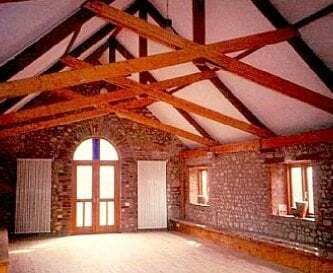 The centre was converted from old farm buildings around a landscaped courtyard and provides a large dining room, commercial kitchens and additional function room with 8 bedrooms offering a variety of adult-sized bunk beds. 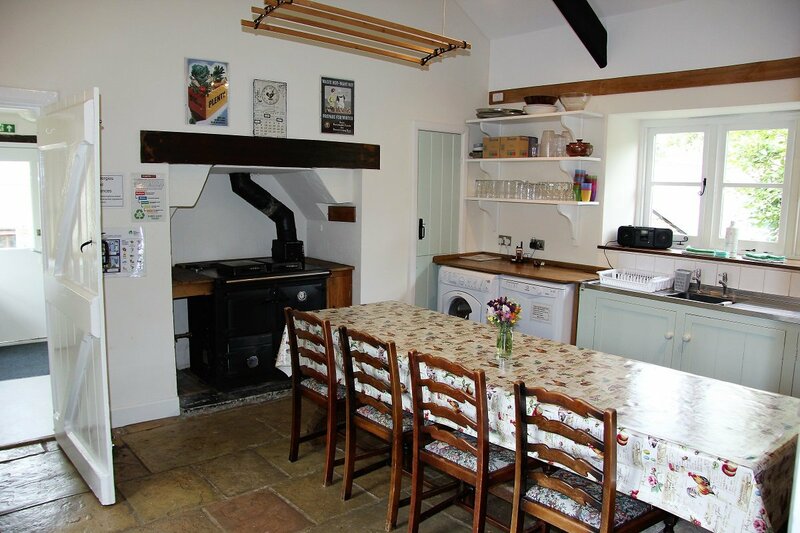 Rebuilt in the 1890’s as the main residence for the farm, Magdalen Farmhouse retains all the old features including Rayburn in the kitchen, wood burner in the lounge, and extensive gardens outside. 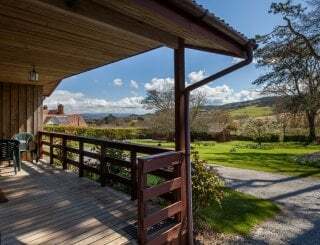 6 large bedrooms provide accommodation for 17 people with a large fully equipped farmhouse kitchen, and sitting room with comfortable seating around the wood burner. The house is centrally heated with wood available for the fires. 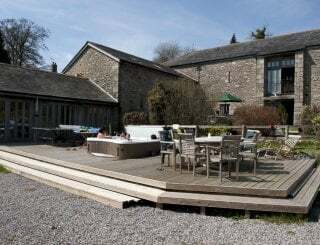 The farmhouse is set around mature gardens with a sunny south facing courtyard and grassed spaces for games (please note that there is a duck pond to one side of the house). On site we also have a wooden climbing frame with zip wire - this may be used at your own risk and must be overseen by a responsible adult. 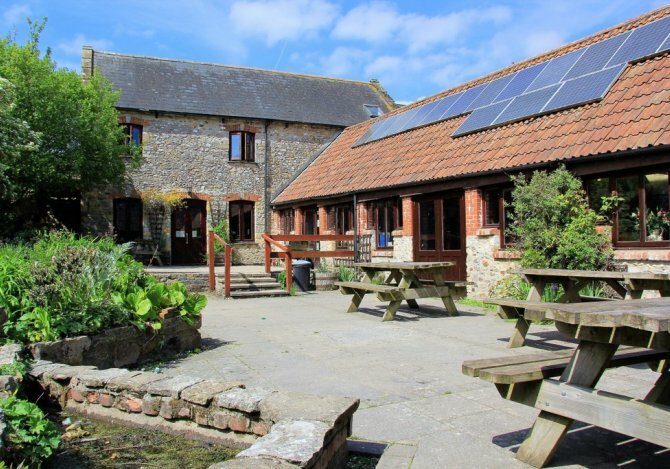 The farm is ideally located for touring the south west with access to many footpaths and cycle routes across the stunning countryside. Guests are welcome to wander around our farm and visit our farm animals and kitchen gardens. The coastal town of Lyme Regis is a 15 minute drive from the farm and opens out onto the dramatic Jurassic Coast with fossil hunting at Charmouth a short drive further. 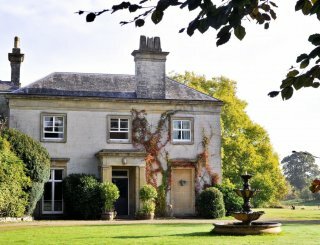 Within a short distance of the farm is the fabulous house, gardens and grounds of Forde Abbey. 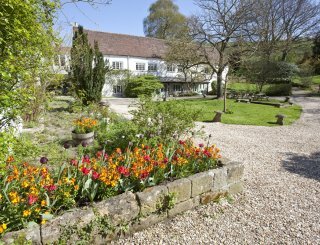 The local market towns of Chard, Crewkerne, Beaminster and Bridport are all within a short driving distance all with good facilities including supermarkets, leisure facilities and the unique West Country Farmers Markets. Sorry no stag/hen parties and all groups must adhere to our noise after midnight policy. 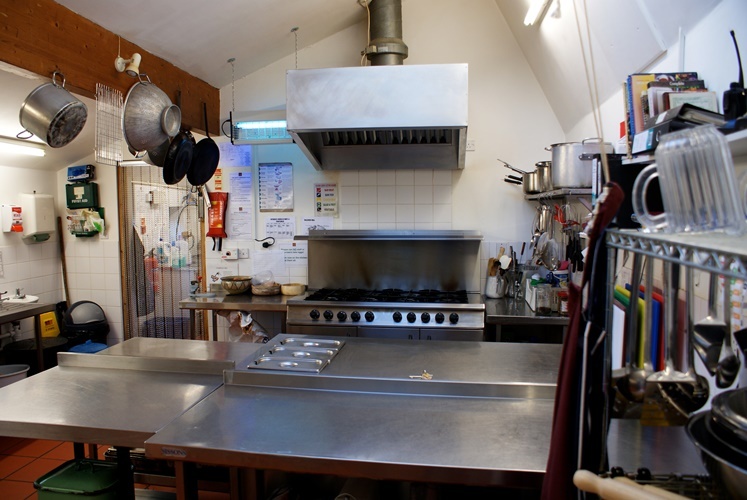 Centre: fully equipped commercial kitchen with 8 burner gas hob and 2 large ovens. 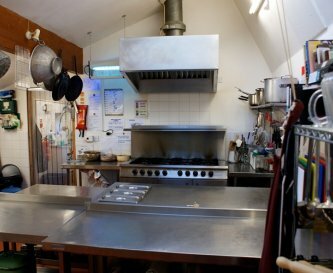 Commercial dishwasher and hot water urn. Farmhouse: well equipped. 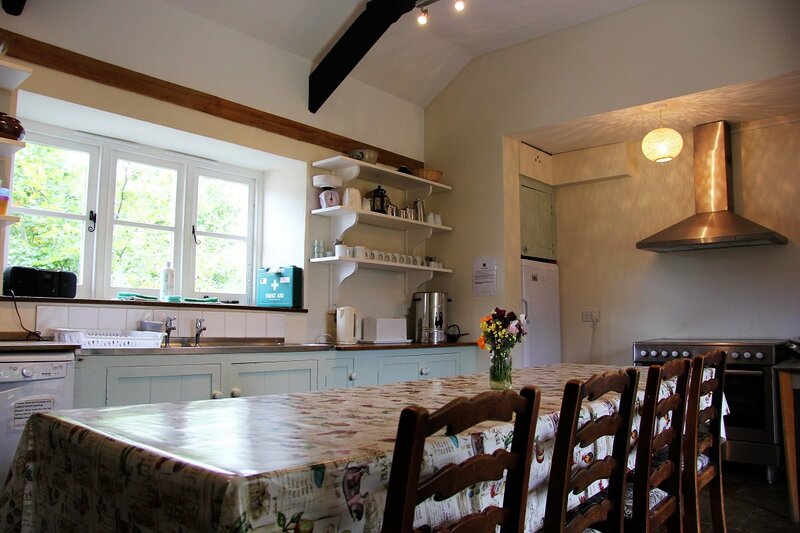 Centre: open plan dining room, spacious area for eating and relaxing, leads directly to courtyard with a cob oven. 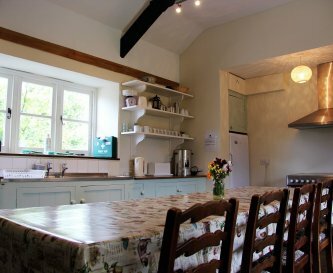 Farmhouse: table in kitchen. 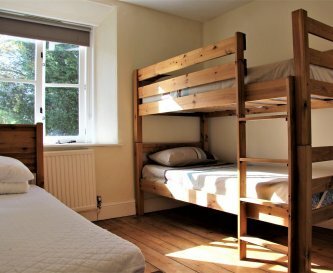 There are several sofas and games available in both properties. Free WiFi. A pay phone is available on site. Mobile phone reception can be received in certain parts of the farm. 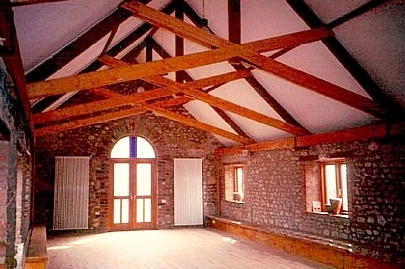 Space for games and a wooden play area are available in the campfield. Centrally heated to provide a warm environment. 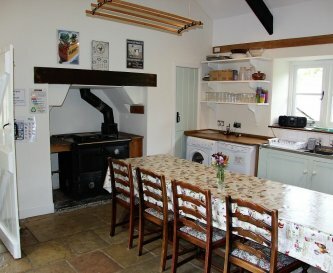 Wood fires in Farmhouse sitting room and kitchen (Rayburn). Open fires in designated area are welcome. 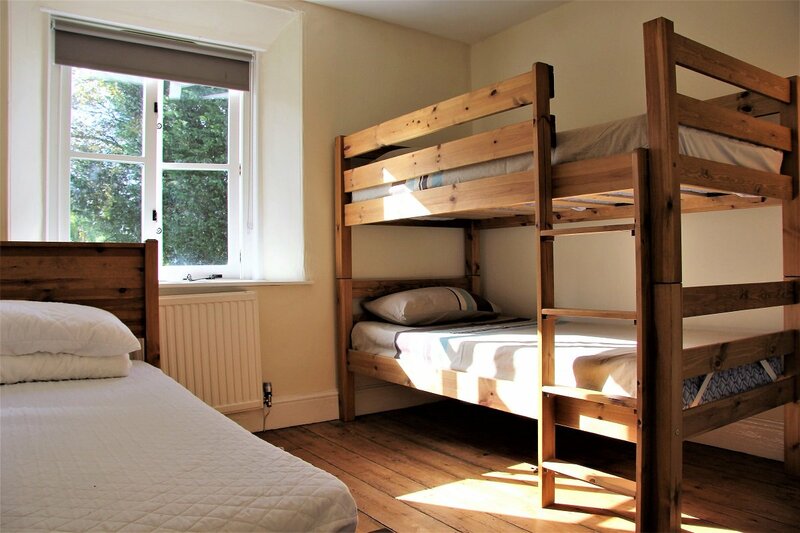 Centre: 8 adult sized bunk rooms with shared toilet and showroom facilities. 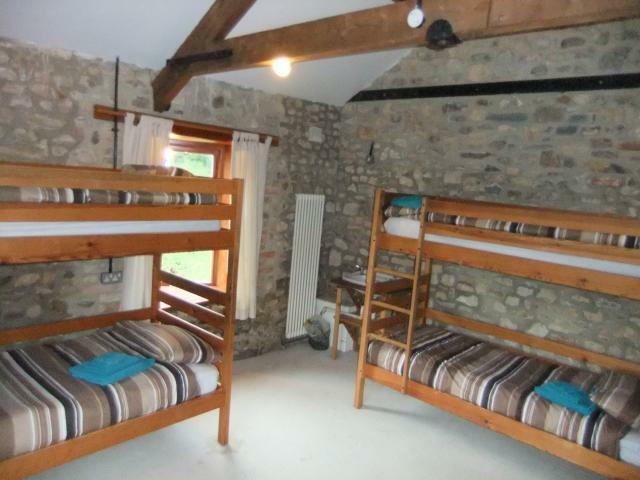 Farmhouse: 6 bunk rooms. Linen and towels are included in the package. 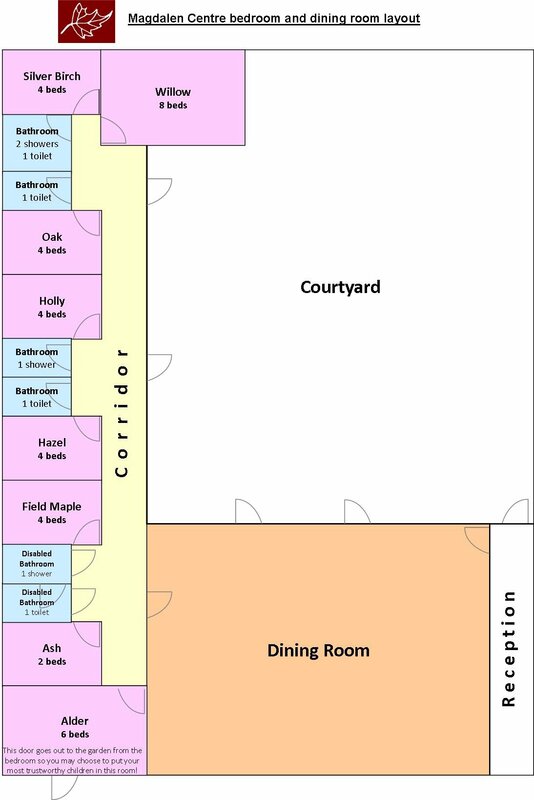 Linen will be left in the dining area for you to choose which beds you would like to use. Shared shower facilities in Centre. Farmhouse has bath and showers, one shower DOC M compliant for less mobile guests. 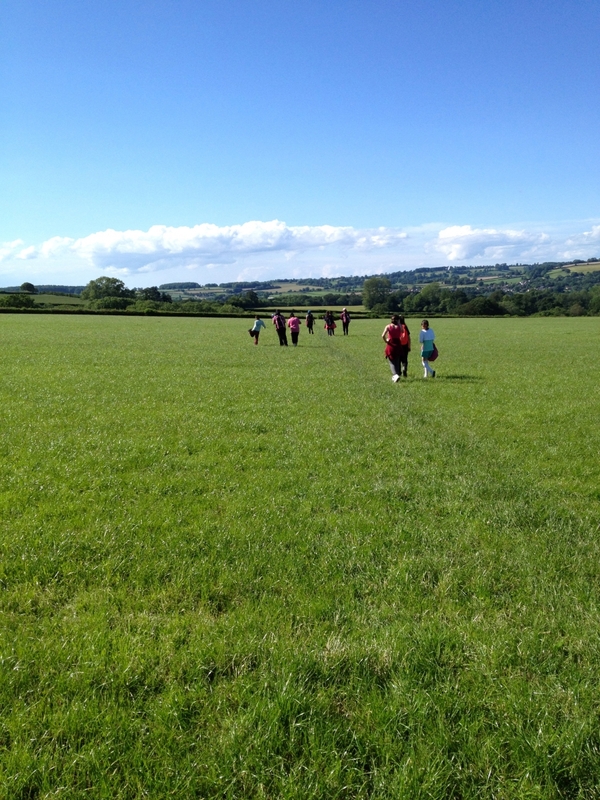 Centre: changing place toilet facility, purpose built wheelchair friendly paths to access farm. Farmhouse: D MOC shower. 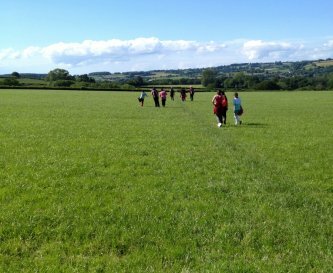 Children (accommpanied by adults) are welcome to tour the farm. There is a wooden play area in the playfield that is shared with both properties. Playfield attached to the centre offers the opportunity to sit around an outdoor fire to share stories and songs. 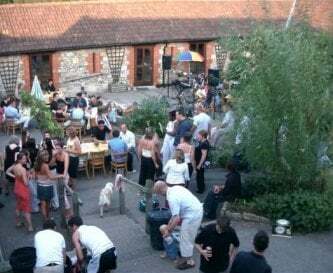 Mature gardens, courtyard, seating. 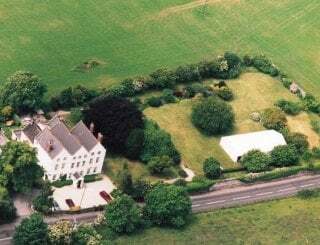 Nearest pool is located in Crewkerne - 4 miles away. There are 2 large designated parking areas with disabled parking close to the main centre. Smoking is not permitted in any building but designated smoking areas are available. Sorry with animals on the farm we are unable to accept pets. Signposted off B3162 between Drimpton and Winsham, near the B3165 between Crewkerne and Lyme Regis. 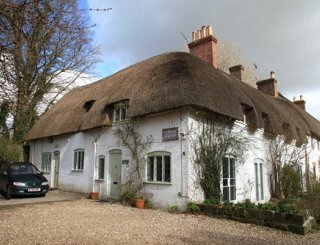 The nearest small shop/post office is located in Winsham, 1.5 miles from the centre. 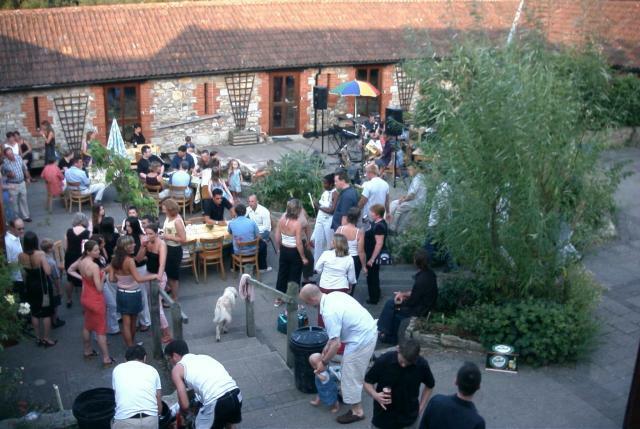 The Squirrel Inn is located less than 1 mile from the main centre. 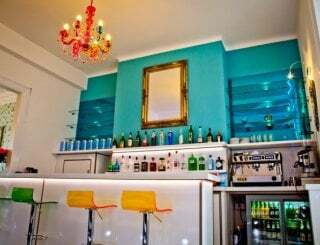 Crewkerne Station - London Waterloo Line - 15 minutes taxi ride to the centre. Between Chard and Crewkerne No96 bus stops at the end of the drive.